The western section of the ruined theater where the bones were discarded and found. A metric ton of cattle bones found in an abandoned theater in the ancient city of Corinth may mark years of lavish feasting, a new study finds. 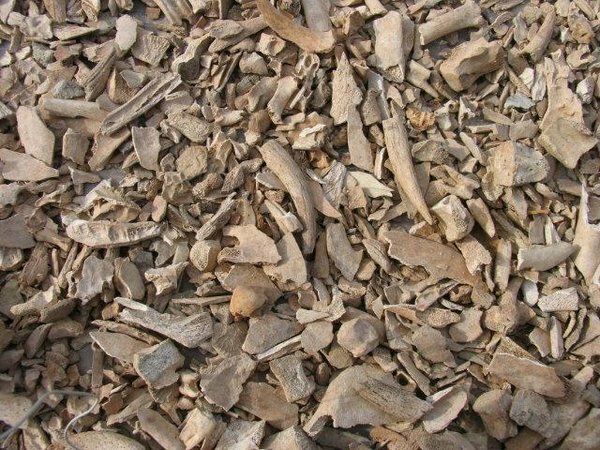 Archaeologists pulled a metric ton of cattle bones from an ancient Corinth theater, perhaps representing yearly feasts in the 4th and 5th centuries A.D.
"What I think that they're related to are episodes of big feasting in which the theater was reused to process carcasses of hundreds of cattle," MacKinnon told LiveScience. He presented his research last Friday at the annual meeting of the Archaeological Institute of America in Seattle. A theater may seem an odd place for a butchery operation, MacKinnon said, but this particular structure fell into disuse between A.D. 300 A.D. and A.D. 400. Once the theater was no longer being used for shows, it was a large empty space that could have been easily repurposed, he said. 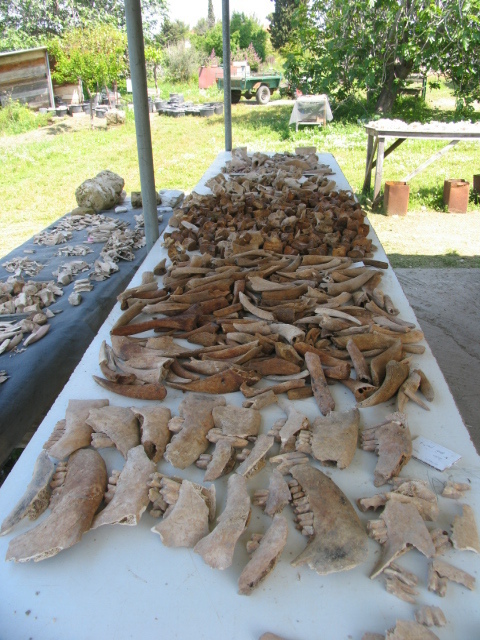 The cattle bones were unearthed in an excavation directed by Charles Williams of the American School of Classical Studies at Athens. They'd been discarded in that spot and rested there until they were found, rather than being dragged to the theater later with other trash, MacKinnon said. 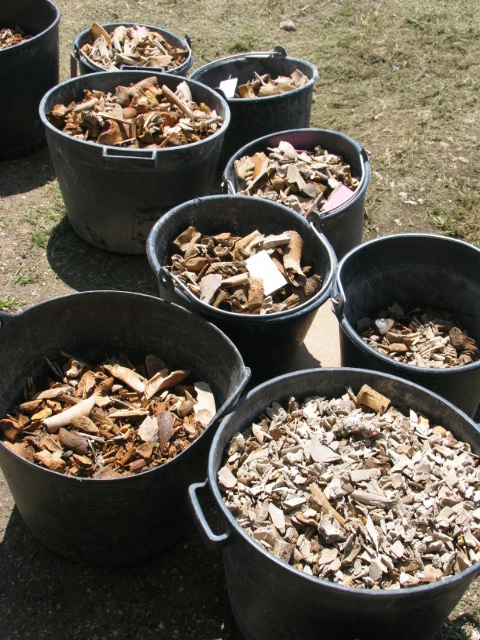 "Some of the skeletal materials were even partially articulated (connected), suggesting bulk processing and discard," MacKinnon said. MacKinnon and his colleagues analyzed and cataloged more than 100,000 individual bones, most cattle with some goat and sheep. The bones of at least 516 individual cows were pulled from the theater. Most were adults, and maturity patterns in the bones and wear patterns on the teeth showed them all to have been culled in the fall or early winter. 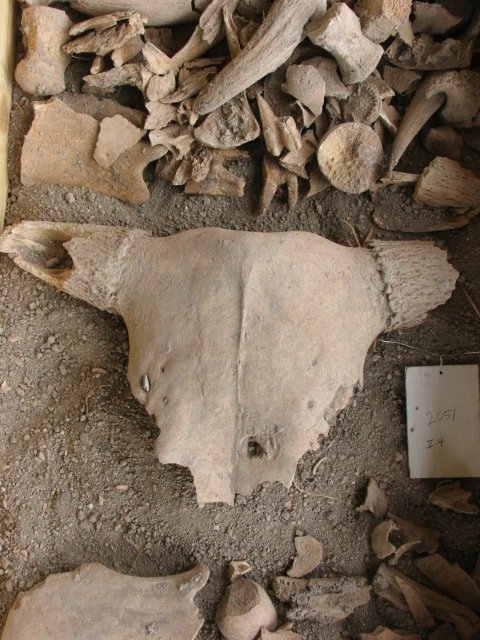 A cattle skull found in the Corinth bone deposit. Most of the bones were from cows. "These do not appear to be tired old work cattle, but quality prime stock," MacKinnon said. It's impossible to say how quickly the butchering episodes took place, MacKinnon said, though it could be on the order of days or months. The bones were discarded in layers, likely over a period of 50 to 100 years, he said. The periodic way the bones were discarded plus the hurried cut marks on some of the bones suggest a large-scale, recurring event, MacKinnon said. He suspects the cattle were slaughtered for annual large-scale feasts. Without refrigeration, it would have been difficult to keep meat fresh for long, so may have been more efficient for cities to take a communal approach. "What goes around comes around, so maybe we'll do it this year and next year, it's the neighbor's turn to do it," MacKinnon speculated. "Neighborhoods might sponsor these kinds of things, so people do it to curry favor." The next step, MacKinnon said, is to look for other possible signs of ancient feasting at different sites. "Maybe there are some special pots, or maybe we'll find big communal cauldrons or something," he said. "Something that gives a material record of a celebration."